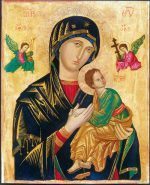 "Our Lady of Perpetual Help, you have been blessed and favored by God. You became not only the Mother of the Redeemer but the Mother of the redeemed as well. We come to you today as our loving children. Watch over us and take care of us. As you held the child Jesus in your loving arms, so take us in your arms. Be a mother ready at every moment to help us. For God who is mighty has done great things for you, and His mercy is form age to age on those who love Him. Our greatest fear is that in time of temptation, we may fail to call out to you, and become lost children. Intercede for us, dear Mother, in obtaining pardon for our sins, love for Jesus, final perseverance, and the grace always to call upon you, Our Lady of Perpetual Help. Amen." Jesus has seen part of his destiny – the suffering and death he will undergo. Though he is God, he is human as well and afraid of this terrifying future. He has run to his mother, who holds him close in this moment of panic, the same way she will be close by his side through his life and death. While she can’t spare him his suffering, she can love and comfort him. So why is Mary looking so intently at us instead of her child in need? Her gaze brings us into the story, makes us part of the painting and the pain. Her gaze tells us that just as Jesus ran to his mother and found refuge, so too may we run to Mary. Her hand does not clasp the hands of her frightened son in a protective grip, but remains open, inviting us to put our hands in hers and join with Jesus. Mary knows there are many things in our lives that are dangerous and terrifying, and that we need someone to turn to in times of suffering and dread. She offers us the same comfort and love she gave to Jesus. She tells us to run to her as fast as Jesus did, so fast that we don’t even think about what we wear or how we go, just so we get there.